To use, place the removable ashtray in one of the drink holders in the front centre console or in the rear centre armrest . To open, lift the ashtray cover in the direction of the arrow . 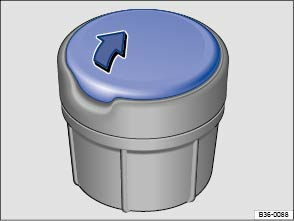 To close, push the lid down in the opposite direction of the arrow. Lift the removable ashtray out of the drink holder. Open the removable ashtray and empty the cooled ashes into a suitable waste container. Once it has been emptied, place the removable ashtray back into the drink holder from above.